The evil Lord Business (Will Ferrell) has plans to steal the Kragle, which will allow him to take control of the city and eventually the world. Lord Business defeats Vitruvius (Morgan Freeman), and escapes with the Kragle. Vitruvius says they must find “the Special” who will find the Piece of Resistance, the only way to stop Lord Business and the Kragle. Emmet (Chris Pratt) is a construction worker. While he goes along with what everyone else is doing, he longs for something more. Emmet meets Wyldstyle (Elizabeth Banks) late one night at the construction site. After finding the Piece of Resistance, Emmet touches it and passes out. He wakes up with the piece stuck to his back. Vitruvius and Wyldstyle take Emmet to the secret hiding place of the Master Builders. The Master Builders are a group of citizens who have extraordinary creativity and can create just about anything. Since they don’t conform, they are shunned and hunted by the police. When Lord Business sends his forces to the secret lair, most of the master builders are captured. 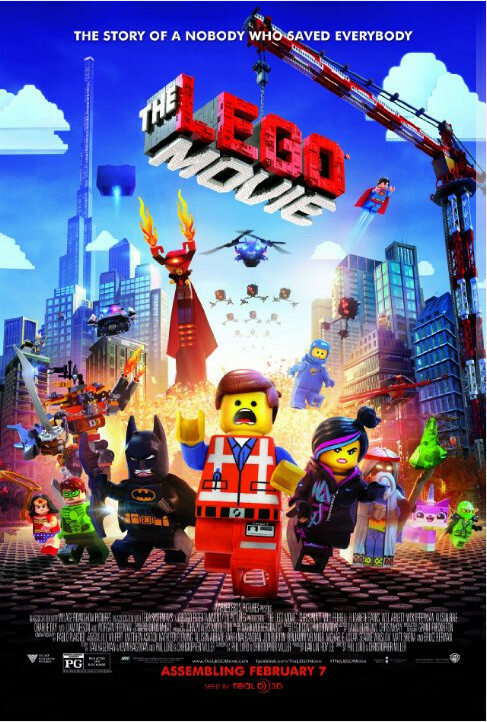 Emmet, Wyldstyle, and a small band of escapees, including Batman (Will Arnett) devise a plan to free the master builders and stop Lord Business and his Kragle. The LEGO Movie is exactly what you would expect if you took the myriad of LEGO video games and smashed them into a feature movie. The colors are bright and the action is fast. It has all the feeling of the games brought to life in an excellently done production. The cast is absolutely loaded with big names in comedy. Chris Pratt, Will Arnett, Will Ferrell, Charlie Day, Will Forte, and Jonah Hill. I could go on, but the list is too long. Pairing such talented comedic actors with a great script makes for a very entertaining movie. There are no lulls in the action. You will be into the movie the entire time. While the movie could be construed as a massive LEGO commercial, which is exactly what it is, that doesn’t take away from the story at all. The entire movie is centered around using your imagination and being true to yourself. It sends a good message to kids. Even if the message is a subconscious ploy to sell more LEGO merchandise. With its eye-popping graphics and its catchy tune, that thankfully isn’t the Frozen one, kids and adults will enjoy The LEGO Movie. If you haven’t seen it by now, you don’t know what you’re missing. How it isn’t up for Best Animated Movie, I don’t know.